I’m looking forward to tonight’s Bellator, event if I won’t be able to watch live on account of the Anthrax and Testament show at the Congress Theater tonight. 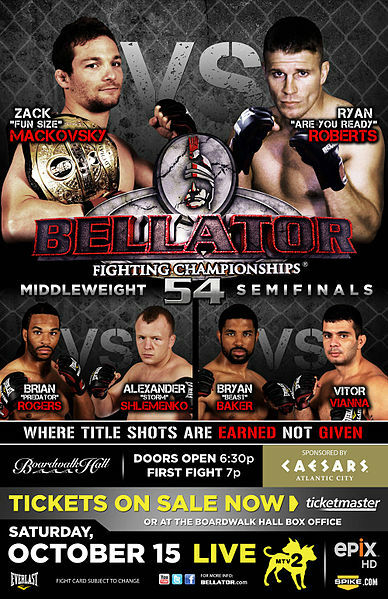 Bellator will continue their season five welterweight tournament, while we’ll see Bantamweight Champion Zach Makovsky in a non-title match against veteran Ryan Roberts. Of course, I do have some questions about tonight’s event. Does this middleweight tournament even matter when the winner will inevitably get beaten by champion Hector Lombard? Alexander Shlemenko, the best in the current field, has already lost to Lombard and I don’t think the other three middleweights would stand a chance. And what good does it do to have a champion like Zach Makovsky when he never defends his title? This might be the last time we see him compete in Bellator this year, where he will only have fought two non-title contests. Makovsky will surely have a tough title fight when he takes on the winner of the current bantamweight tournament (presumably Alexis Vila), but that seems like a waste for this talented of a fighter to compete so sparingly. Nonetheless, tonight’s show should be a very good one. Prospect Rene Nazare, who is now 3-0 in his Bellator career, shouldn’t be forgotten. Nazare will likely ensure himself a spot in the next lightweight tournament with a win here. Speaking of that tournament, it’s shaping up to be a good one should it take place in season six. Nazare, Kurt Pellegrino, Patricky Freire, Phillipe Nover, Marcinb Held, and the loser of Eddie Alvarez vs. Michael Chandler seem to be likely participants in what could be a very talented field. Until then, we have Bellator 54 airing live tonight on MTV2 at 9:00 PM EST/8:00 PM CST with a replay shown at 1:00 AM EST/12:00 AM CST. I’d love to see this replay, but I also don’t much like the idea of staying up until midnight. I’ll probably be quite tired by that time on account of being an old person, but we’ll see. We’re going to see some fireworks in this one with both fighters favoring their strikes. 25 of Shlemenko’s 40 wins have come by some form of knockout, while all but one of Rogers’ eight wins have been by (T)KO. These things lead me to believe that Shlemenko and Rogers will spend a significant amount of time punching one another. Both fighters are very tough and rarely ever get knocked out, so I won’t be surprised if this one goes the full 15 minutes. I give Shlemenko the edge just because he has the experience and he’s a very scary striker. His only loss in recent memory was the aforementioned defeat to Lombard and Shlemenko has been very good otherwise. I think we’ll see Shlemenko take a unanimous decision victory. Bryan Baker has quietly put together an awesome career in just under four years. He holds wins over Jared Hess, Joe Riggs, Jeremy Horn, Sean Loeffler, Matt Horwich, Rory Singer, Jesse Forbes, and he’s defeated Eric Schambari twice. His only two losses have been against fellow tournament competitor Shlemenko and top UFC contender Chael Sonnen. Meanwhile, Vitor Vianna beat…I don’t know, Sam Alvey? Francis Carmont? It just doesn’t sound the same. I see Baker taking an early TKO victory. Vianna is a tough opponent and a great Brazilian Jiu-Jitsu practitioner, but Baker’s put together such a stellar resume and I have every expectation of him winning this bout. Zach Makovsky, awesomely known as “Fun Size”, is definitely one of the top two or three fighters in Bellator. He’s a supremely talented bantamweight and he will win this fight. Ryan Roberts has been around a while and has some solid wins over guys like Nick Mamalis and Jeff Lentz, but Makovsky is one of the rising bantamweight talents in all of MMA. Rene Nazare will stay undefeated. I have no reason to believe that Jacob Kirwan has a chance here. Nazare is being built as a force at 155 pounds and he’s delivered so far. He’s actually injured two of his three opponents in Bellator thus far, proving to be a legitimate dangerous fighters. Look for Nazare to finish this fight.